In Oxford Advanced Learners’ Dictionary, improving is making or becoming better; making good use of something.7 Or it can be said that improving is doing in any way in making something better, or becoming increased. Speaking is making use of language in ordinary voice; uttering words;knowing and being able to use a language; expressing oneself in words; making a speech.8 Speaking skill is the ability to use the language for expressing idea. Technique is the specific activities manifested in classroom that were consistent with a method and therefore in harmony with an approach as well. Debates can present opportunities for students to engage in using extended chunks of language for a purpose: to convincingly defend one side of an issue. 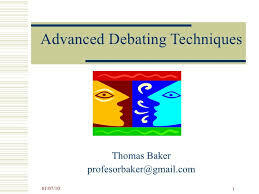 A debate is a type of role play where students are asked to take sides on an issue and defend their positions. It can be defined that debate technique is an activity of teaching speaking where students are divided in different sides of an issue and have to defend their opinions. Students have a lot of opportunities to practice speaking through this technique.